This section on Catapult assembly continues the theme that the one-design boat makes the basic process clear, while there is scope for each helm to find their own best routine. 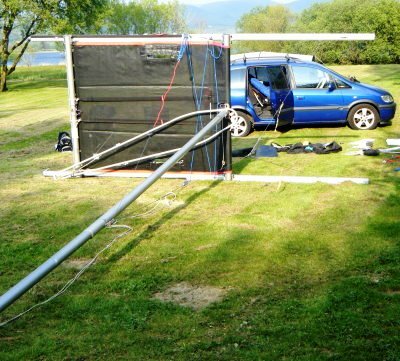 Most helms do this in two stages, as the lower mast section can be lifted and manoeuvred easily, as Chris demonstrates below at Bassenthwaite. 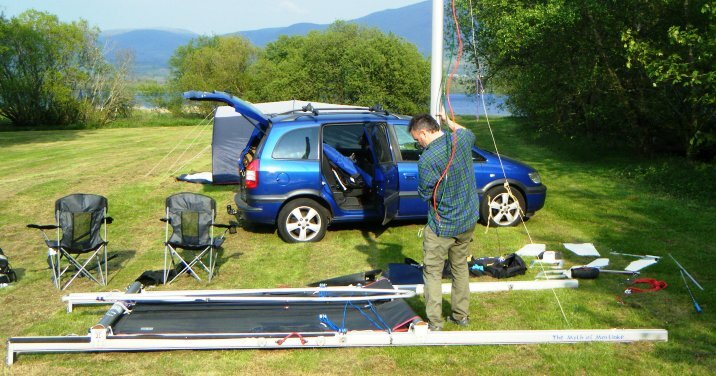 Paul's approach (right, at Bala) is lifting the lower mast in from the back, with the shrouds slack, so that it sits hanging forward while the forestay is attached. 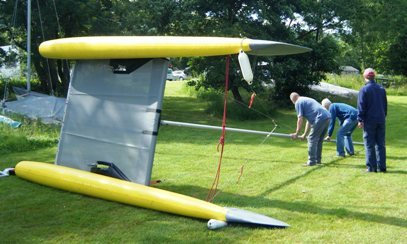 Above: Chris and others tip the boat with the lower mast on the frame only, to attach the topmast---which seems less effort. 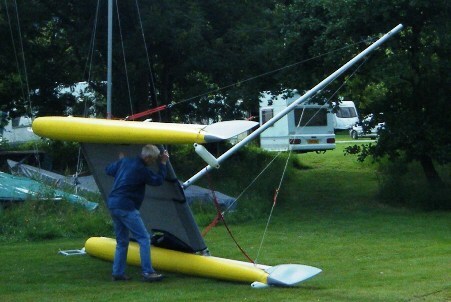 Above:With the mast up, the foot of the mast is tied down by a line running up from the beam through a fairlead on the mast, preventing the mast from lifting out in the event of a capsize recovery (when the mast needs to be canted fully over during capsize recovery) but still allowing rotation. 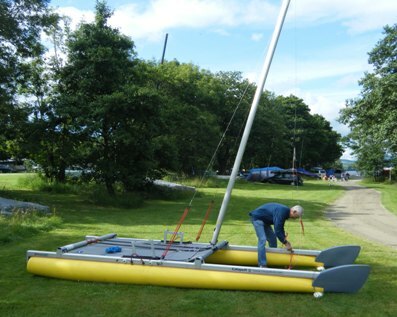 Below: Alastair swears by raising the mast as one piece, to avoid the stage of tipping the boat (or frame) to insert the topmast. 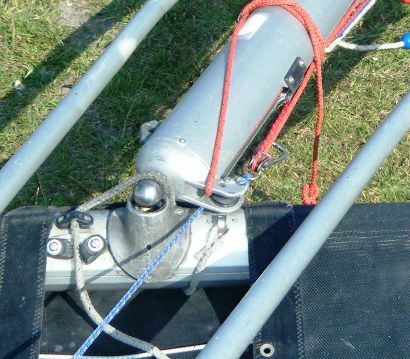 As illustrated below, one shroud and the forestay are attached (with the rigging slackened off) and the foot of the mast is tied down using the tie already fitted. 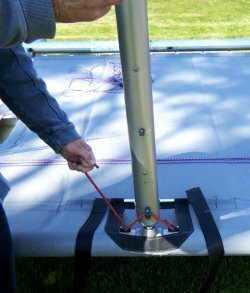 Although a bigger unit to handle, once up it sits stably, and a final check can be made that the clips attaching the forestay bridle and the shroud are not twisted, before clipping on the other shroud. 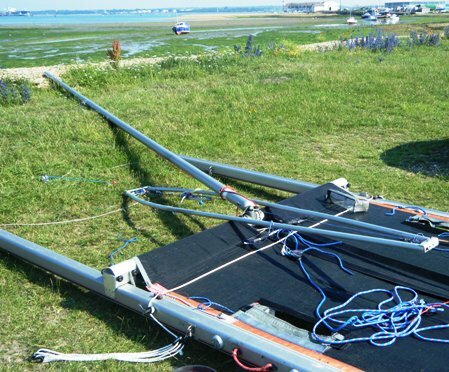 Apart from cutting out the stage of tipping the boat, an advantage is that the halyard and release line can be set up taut on the ground, without having to gaze into the sky to check.